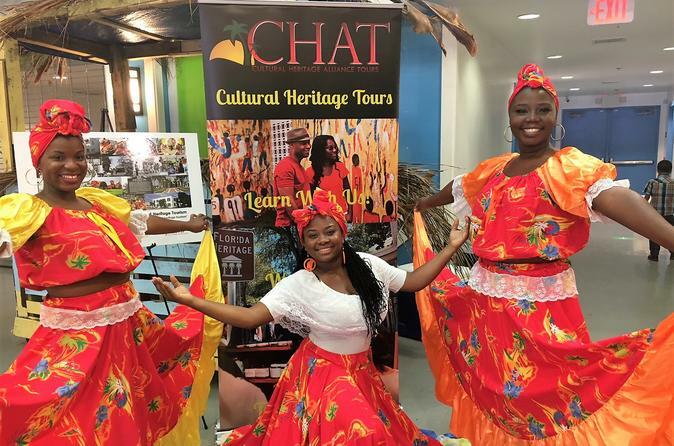 This first and only tour experience of its kind offered by CHAT Miami is available for locals and visitors to book now. Our Little Haiti Dance & Dine Tour provides a unique interactive edu-tainment experience that will stimulate all of your senses. You’ll meet up with our professional local tour guide at the Little Haiti Caribbean Marketplace and will be led on a 60-minute walking tour that will immerse you in the rich culture and heritage of this historic Miami neighborhood. Following the walking tour, you will learn about and participate in a 45-minute Haitian dance and drum demonstration and get a chance to move your body to the sounds of Haitian music (no rhythm required). But wait, there’s more! After all the fun dancing, we know you’ll be ready to indulge in some authentic Haitian bites so you will enjoy a delicious Caribbean or Creole lunch including Griot (fried pork), jerk chicken, curry goat, Bannann Peze (plantains) and rice & beans. Now, this is a unique, fun and memorable experience to have in Little Haiti! So, go ahead and book your spot today. Space is limited up to 15 people per tour. Minimum two people per booking. Age 5+.